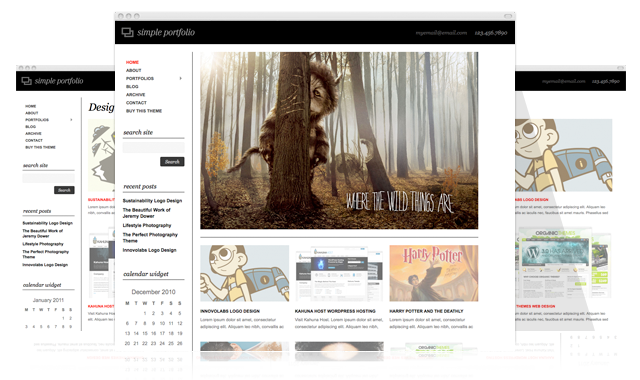 Organic Themes is proud to announce a new theme to our arsenal, the Simple Portfolio Theme. While our last theme focused primarily on text and typography (The Verbage Theme), the Simple Portfolio focuses on presenting images in a beautifully simple layout. It’s the perfect solution for photographers, designers, illustrators, artists and casual photo bloggers. See for yourself in our demo. The Simple Portfolio is the first of our themes to introduce the usage of Custom Post Types, which are utilized for the featured slider and blog entries. Portfolio’s can be displayed in a 1, 2 or 3 column layout. The theme features a vertical menu layout in the sidebar, allowing for limitless addition of portfolios. The Simple Portfolio features post navigation within specific categories. This is particularly cool since separate portfolio’s are managed as categories within the theme. For instance, if you have a portfolio category of “Illustration”, you can navigate specifically through each “Illustration” on the post level. Creating seamless navigation through your site and adding to the user experience. Very nice theme. Cool to see custom post types in your theme arsenal. This is something different portfolio theme that I’ve come across. Very Nice …your talent always amazes me!! Nice work. I really like the professionalism of the designs. Another nice art piece. very creative..I love your graphics. Very good theme, professional work. at the moment its like the clever design suddenly stops once you get to the post level. There’s plenty of great free gallery plugins available, so we haven’t really felt the need to develop our own. Even the native WordPress gallery is great when combined with a plugin like Lightbox Plus. My personal favorite gallery plugin is the Portfolio Slideshow, http://wordpress.org/extend/plugins/portfolio-slideshow/. It’s simple, elegant amd easy to use.